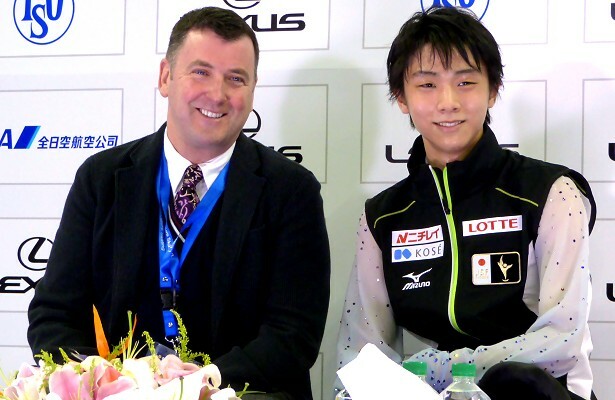 Yuzuru Hanyu of Japan with coach Brian Orser at 2014 Cup of China. Yuzuru Hanyu of Japan reached the pinnacle of figure skating when he won Olympic gold in Sochi and the World title last season at just 19 years of age. However, the beginning of the new season has not been so easy on the skater. Earlier last month at Cup of China, the two-time and current Japanese champion suffered a collision with Han Yan of China during the free skate warm up. The incident made headlines worldwide and started a discussion about the safety of the athletes. Both skaters were going backwards and did not see each other. The skater, who is coached by Brian Orser, received stitches to his chin and had other bleeding lacerations. Yet he came out to compete, with a bandage around his head, looking like a wounded warrior launching himself into battle again. Although he fell five times, Hanyu has no regrets. Hanyu, who still hung on to second place at Cup of China, returned to Japan the next day and had to rest for ten days. The 2014 Olympic champion had the opportunity to review the accident over and over as it was televised and featured in newspapers and online media multiple times. He is well aware about the discussion that was going on around his decision to compete. Going into NHK Trophy three weeks later, the current World champion was understandably not yet at the top of his game, barely making the Grand Prix Final after finishing fourth. He missed his quads and made some other errors, although he did land several good quads in practice and in the warm up. Bottomline, the coach feels the defending Grand Prix Final champion just needs to train more. Orser feels it is tough for any Olympic champion going into a new season, and feels this will be a good learning experience for Hanyu. In order to avoid too much travel between different time zones, Hanyu stayed in Japan after NHK Trophy to prepare for the Grand Prix Final. It is all about challenges for the Sendai native. Challenging himself is what keeps him motivated after all the success he achieved. Hanyu, who turns 20 year old on December 7, feels that he himself hasn’t changed after winning Olympic gold, but admitted that it is sometimes difficult to deal with the attention coming from the media and the fans. First and foremost, he just wants to be an athlete—a skater that competes and performs.